For many riding in the rain is a common thing.. maybe you are a daily commuter or you work on two wheels such as a courier, pizza delivery etc or maybe you re just one of those people who always seems to get caught out in the British summer weather. 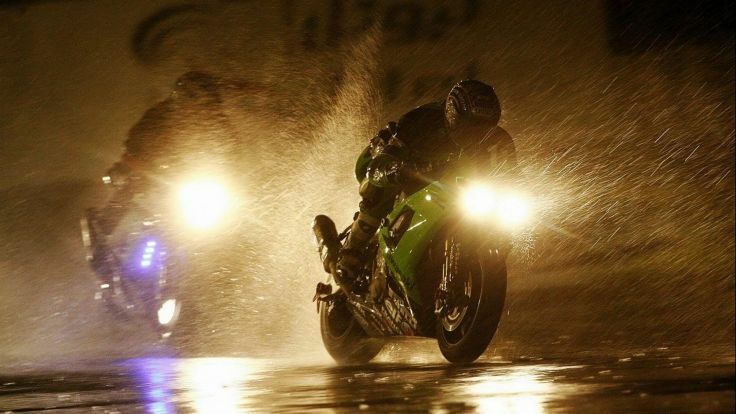 Here is our top 10 tips for riding in the rain. The biggest thing about getting wet is being uncomfortable.. when you get wet it can get very uncomfortable so it makes sense to invest in some waterproof gear, especially for your feet and hands. There is no harm in buying 2 or 3 pairs of gloves or boots with a pair for warm weather, winter riding & riding in the rain or using cheap alternatives such as wearing rubber gloves under your regular gloves to stop your hands from getting wet.. usually when you get wet you get cold very quickly & that’s when things get uncomfortable. It also makes sense to carry a spare pair of gloves or keep a second pair of boots at work etc so at the end of the day when you need to make the return journey, you are not putting your hands into wet gloves or walking round all day in soggy boots. Waterproof boots are essential if you do a lot of winter riding & can also be used during the rain in the summer. You can also buy waterproof oversuits or waterproof leggings & an alternative is to wear an oversized waterproof jacket over your regular leathers or riding atire. Always ensure you are visable by wearing hi-viz and reflective materials, or brighter colors so you stand out on the road to other motorists. Water on visors can be easily repelled by using a decent gloved finger but it may be worth investing in a vee-wipe, which is a piece of rubber that slides over your thumb you can use like a windscreen wiper as a normal gloved finger could scratch the visor. If you get into the habit of covering the brake, thus it could mean you’ve just saved yourself around a second of reaction time, and can stop a little sooner. 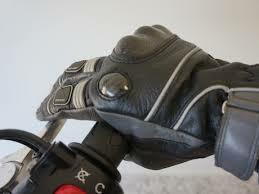 Covering your brake lever can mean the difference between life and death. Also, keep your distance from what’s in front.. a good safe following distance is the gap of 2 lamp posts but you may want to double that to four while riding in the rain, which means more time if any emergency braking/swerving action is needed. 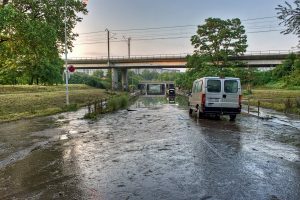 It’s a fact that wet roads offer less grip than dry roads, and some areas are much more dangerous than others so be mindful of things like cats-eyes, painted lines, manhole covers, grids, water dripping off overhead bridges, power lines or trees. Also if you see a rainbow on the road surface caused by oil or diesel spills try to avoid it & if possible don’t try to brake anywhere near it as you will lose traction immediately. Also be aware that any slippy road surfaces when it’s dry could be deadly in the wet. 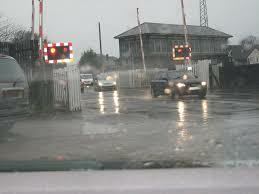 When approaching wet railway tracks on a level crossing while riding in the rain, take them on as close to perpendicular as safely possible, as it is less likely the tires will slide sideways on the rails. Consider as well, many large cities now use tram systems, which again means sometimes riding across or between tracks so if possible stay off the rails so your tyres don’t follow the grooves where the tramlines run as where the lines go is where your tyres will want to head. It is also worth remembering the contact patch of a bike tyre with the road is roughly the size of the palm of your hand, also that on bikes with skinny tyres such as learner bikes or mopeds the contact patch can be even smaller which means the smaller tyres will be prone to following the rails more than the road surface, so please be aware that even on a dry day train tracks can be difficult to find grip on meaning in the wet you need to take more care than usual. Plus a railway crossing or tram line is not exactly the safest place to come off on, not just for the obvious reasons, but also the hazards of gaps & debris in the rails where it meets the road surface. Remember on a bike you can’t lean the same as how you would in the dry so may need to learn a new technique for riding in the rain. It’s more about mass & keeping the bike as upright as possible while staying smooth especially when changing direction rather than leaning the bike over quickly to change direction or hanging off the bike using the weight to pull it into the corners as you would in the dry. You’ll have more control and traction if you lean your body & keep the bike more upright or perhaps adopt an off road type riding technique (remember riding off road is a lot like riding in the wet or snow) which is to sit as upright as possible & lean the bike over rather than bike & rider. Also consider you will need to take corners much slower so you won’t need to lean as far in the curves as you normally would. Use your bodyweight & mass to get as much weight over the tyres when you need to if ever you need to get some extra traction to stop the tyres from slipping or simply so the suspension damping doesn’t have as much travel to keep the wheels firmly on the ground when going into traveling water as sometimes when you hit deep or travelling water it cant be like hitting the brakes then the bike will slow or the suspension dip suddenly when least expected. I’ve mentioned above about staying smooth or using body positioning to keep the bike upright or ensuring the traveling water on the tyres doesn’t cause you to lose traction, but this is also important with regards other important aspects of riding, primarily the brakes. Ease the brakes rather than grabbing at them sharply & loading up the front or rear suspension of the bike to much which means you lose traction or make the bike unstable. Always keep to the 50/50 braking technique in the rain (50% front & 50% rear brake pressure) where as ordinarily you would use at normal road conditions a brake ratio of 75% front & 25% rear brake control. The rear brake helps most with stability which also ensures you can stay safe riding in the rain. The key is to Slow down, ride smooth & stay alert. 7. When the rain stops but the road surface is damp. You may see this a lot on motorsport tracks during a wet race, when the rain stops, where the car or bikes are running will be the 1st part of the track to dry out as the tyres are expelling surface water & the heat from the friction is warming the contact patch on the track surface helping it dry. With this in mind, try to run where the car tyres have been running as this will be the dryer line. It’s often said that a newly fitted car tyre with a good tread will remove roughly the same amount water from the road as it would take to fill a bucket with each full revolution of the wheel, so you can use this to your advantage. Also remember that on a dual carriageway or maybe even a motorway where they may have a lot of lorries or buses & coaches using the road, that surface water spray can get thrown up sometimes long after the rain has stopped, showering you in water as the wheels on a truck are a lot larger than on a family saloon car so expel huge amounts of the surface water & usually in parts of the road where other vehicles don’t run. Checking your tyres should be one of your daily checks on your bike. 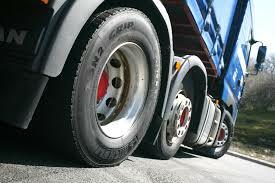 Do make sure the tyre has sufficient tread & that the tyres are properly inflated. 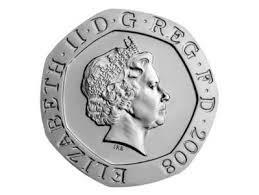 A good indication to check your tread depth is legal is to use a 20p piece & if the tyre tread doesn’t come above the outer ring on the circumference of the coin, chances are it’s time you need to replace it. Also make sure your tires are not worn inconsistently across the tyre and that the tyres have correct pressure. Consider as well, if carrying pillions or heavy loads on the bike, it also makes sense to pump up the rear tyre a little more. Tyre technology evolves all the time so ask a dealer or expert for advice on tyres if you do a lot of wet weather riding or have any concerns about how a tyre will perform in the wet on your particular bike. With any tyre, heat helps the tyre perform better but in the rain it will take longer to warm up.. you can increase the heat in the tyres a little by slowing down & accelerating in short bursts (provided it’s safe to do so) which can help put some heat into the tyres in the rain as well as in the dry. Don’t be tempted to swerve or weave to increase heat as they do on a race track as this doesn’t work with road tyres & only work with tyres designed for extreme high speed running. 9. Don’t trust the puddles. Remember that a puddle or a large pool of water usually forms where there is a dip, a small valley or a hole in the road & it could be a pothole, a deep rut or even a metal grid or manhole. However, it may seem fun sometimes to ride through the puddles & create a wave but riding over a pothole or manhole cover can be dangerous in the dry even when you can see it, so it would be madness to do it if you can’t even tell what’s there. If you can’t avoid riding through a puddle, hold the throttle steady, keep the bike upright, and don’t touch the brakes so you avoid aquaplaning. Also once you have ridden through any big puddle or gone through a ford or stream of water, test the brakes & lift off the throttle a little as sometimes until the disk or drum has dried or heated back up enough that the water evaporates, your brakes won’t be working the same & will be much less efficient when you apply the brakes when you really need them. 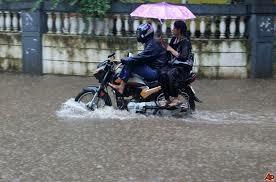 Also take into consideration, if you hit a patch of deep water, the tyres could aquaplane – when a layer of water builds between the wheels of the vehicle and the road surface, leading to a loss of traction that prevents the vehicle from responding the way you want- or if the water is deep considerably slow the bike in the same way as hitting the brakes suddenly. Be mindful as well for any obstacles that could be lurking under the waterline as well such as bricks that could be unseen or even unseen broken glass from a previous road accident that could puncture your tyres. 10. Get rid of the water that settles on yourself. In heavy rain, water will often gather in creases in your clothes or even in your lap, and if left too long, it may soak through – especially in the one area where it can be embarrassing as it will look & feel like you have wet yourself once you step off the bike. It’s not a bad idea to stand up on the pegs now and then, to clear the rain a little or if needs be stop & get off the bike for a minute & brush yourself down. Also if carrying a backpack or if using a set of textile throw-over panniers or a sports bag bungee’d to the rear seat to carry your belongings, it’s a good idea to wrap what’s inside in plastic carrier bags or bin liners to act as waterproofing. Also things like handlebar mounted sat-nav’s & mobile phones kept in pockets won’t like the rain, so using cling-film or adapting clear plastic food tubs to carry them in can help get them to where you are going without water damage. Just remember most mobile phones or sat-nav’s are not covered by the store guarantee or the manufacturers repair warranty for liquid damage.